Nowadays, vampires are a mainstay of TV, film and literature, but in medieval Europe they were a terrifyingly real prospect and omens of death and doom. Taking the archaeological discovery of mutilated medieval skeletons buried in the west of Ireland as a starting point, Vampire Skeletons Mystery traces the rise of the vampire from medieval folk terror to 21st-century fantasy. The fear of the undead seems rooted deep in the human psyche. But could a number of skeletons found buried in a quiet field really signal that vampires were once on the loose in Ireland? Using medieval texts alongside cutting-edge forensic science, a team of experts from British and Irish universities explains how these ancient burials fit into a belief system that spanned medieval Europe and still survives in remote rural communities to this day. They have been known by many names throughout history. Creatures that prey on the blood or life-force of the living have frightened millions into locking doors and windows at night. Cultures around the globe each have their own depictions of these monsters, but most have come to know them as Vampires. However, what led our ancestors to put so much faith in the creation of these beings? Prior to current biological understanding, a corpse could show signs of “life” after death. Many misunderstood blood from the mouth and nose as being signs of the creature feeding. The truth? Gases from decomposition cause remaining fluids in the body to be forced out through any available orifice. Elongated teeth after death were viewed as signs that the dead were rising from the grave to feed. The truth? Receding of the gum-line and lips is a common occurrence of decomposition, which makes the teeth look like they have grown longer. This is also a sign of some forms of porphyria. Our ancestors viewed the growth of fingernails after death to be a sign of the dead manifesting claws. The truth? As in teeth, decomposition causes the skin to recede from fingernails as well giving the illusion that the nails are growing. Cravings for blood in the early centuries could get one burned at the stake. However, cravings for a certain material is often a sign of a deficiency in our diets. The truth? Those suffering from Iron-deficiency Porphyria could experience cravings for iron-rich foods – such as meat and blood. As this has been embellished upon for hundreds of years, some are affected by sunlight, and this could cause severe irritations, rashes, and even burns. The truth? There are a variety of illnesses that affect people on a regular basis keeping them indoors at all times – such as forms of Porphyria. Prior to Christianity, crosses were unheard of which left humans without a means of deterring the vampire. The truth? After the creation of Christianity, vampires took on characteristics of the religion and were thus affected by a symbol of divine nature – such as the cross. Like werewolves, it’s thought that some vampires have been able to change shape and species at will. Versions of Dracula could shape-shift into a bat. The truth? There has been no scientific documented evidence that anyone could shape-shift in this manner. Scientifically, you could not alter the mass of an object to be less than or greater than the current mass. At least, not without altering the density of the mass. Your mirror won’t show you if a vampire is coming up from behind you. The truth? The only way to hide something from view in a mirror is to bend the reflection of light around the object – are we saying vampires have cloaking technology? It’s the stuff of nightmares: A dig at a macabre graveyard has revealed a Bulgarian vampire pinned to his resting place by a metal spike. The ancient skeleton, identified as a 35 to 40 year old male, is only the second ever skeleton with a spike driven near its heart in this way, after one that was found last year in the southern town of Sozopol. 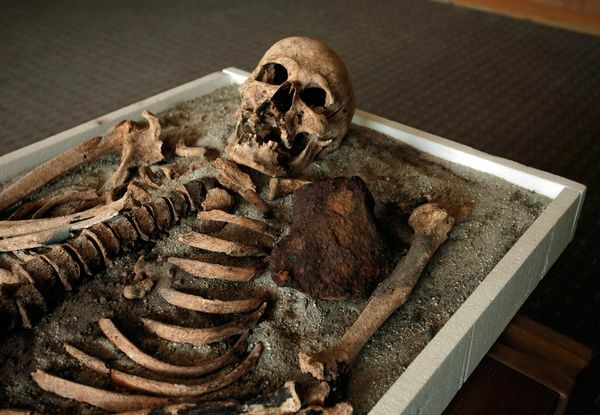 It is thought the man, considered to be a vampire by his medieval contemporaries, was pinned to his grave using the ploughshare – the metal end of a plough – to prevent him from leaving at midnight and terrorising the living.